A new type of solar collector that uses gold nano-rods could convert sunlight into energy without many of the problems associated with traditional photovoltaic solar cells. 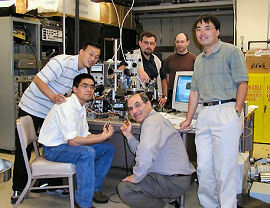 The developers of the new technique, from the University of California – Santa Barbara, say it is “the first radically new and potentially workable alternative to semiconductor-based photovoltaic devices to be developed in the past 70 years.” They provide details of the new solar hydrogen generator in the journal Nature Nanotechnology. In conventional photovoltaic cells, sunlight hits the surface of semiconductor material, one side of which is electron-rich, while the other side is not. The photon excites the electrons, causing them to leave their positions, and create positively-charged “holes.” The result is a current of charged particles – electricity. In the new technique, it is not semiconductor materials that provide the electrons and venue for the conversion of solar energy, but a “forest” of gold nano-rods operating in water. Specifically, gold nano-rods capped with a layer of crystalline titanium dioxide and platinum, and a cobalt-based oxidation catalyst deposited on the lower portion of the array. As the “hot” electrons in these plasmonic waves are excited by light particles, some travel up the nano-rod, through a filter layer of crystalline titanium dioxide, and are captured by platinum particles. This causes the reaction that splits hydrogen ions from the bond that forms water. Meanwhile, the holes left behind by the excited electrons head toward the cobalt-based catalyst on the lower part of the rod to form oxygen. 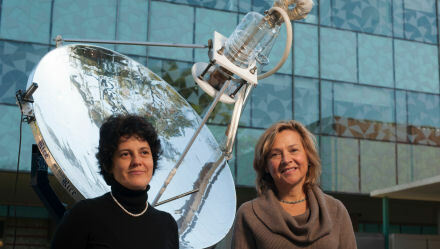 Though still in its infancy, the research promises a more robust method of converting sunlight into energy. “Despite the recentness of the discovery, we have already attained ‘respectable’ efficiencies. More importantly, we can imagine achievable strategies for improving the efficiencies radically,” Moskovits said.